Gloria French was a jolly widow with dyed blonde hair, a raucous laugh, and rosy cheeks. When she first moved from London to the charming Cotswold hills, she was heartily welcomed. She seemed a do-gooder par excellence, raising funds for the church and caring for the elderly. But she had a nasty habit of borrowing things and not giving them back. They’re just small things—a teapot here, a set of silverware there—so it’s quite the shock when she is found dead, murdered with a poisoned bottle of elderberry wine. Afraid the murder will be a blight on the small town, Parish councilor Jerry Tarrant hires private detective Agatha Raisin to track down the murderer, but the village is secretive, and the residents resent Agatha’s investigation. Of course, that doesn’t stop the ever-persistent Agatha from investigating and sticking her nose where no one wants it—especially as the suspect list grows. And, as if it isn’t enough that Agatha’s ex has reentered the picture, the murderer is now targeting Agatha! 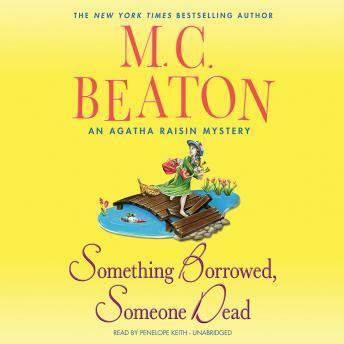 With M. C. Beaton’s Something Borrowed, Someone Dead, the bossy, vain, and absolutely irresistible Agatha Raisin continues to be a fan favorite. Good reading. I enjoyed the story very much. Though the reader's voice is grating at times, she does a very good job with different characters' voices.